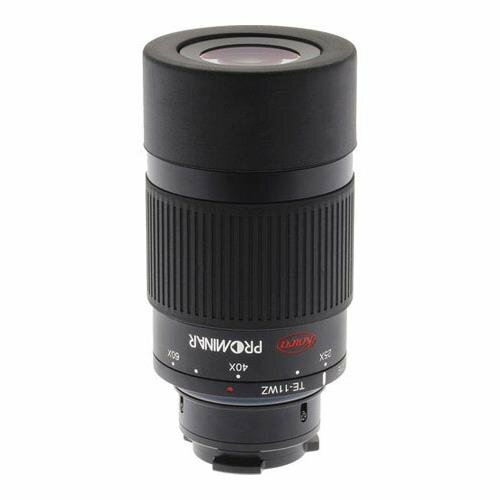 Kowa's new TE-11WZ 25-60x Wide Angle eyepiece features XD "eXtra low" dispersion glass to produce the clearest image reproduction and is compatible with the TSN-880 and TSN-770 Series scopes. This adjustable zoom eyepiece allow the user to maintain full image control in a variety of activities. •Orders that are placed from Mon-Fri before 3:00pm Eastern Time, will most likely ship the same business day. We are closed on weekends. •Shipping charges listed are for orders shipped to Contiguous US only. Additional shipping fees apply for orders shipping to Alaska/Hawaii/Puerto Rico; please call or click below for shipping rates. •WE DO NOT SHIP INTERNATIONALLY. •We ship with USPS & UPS and can provide tracking numbers after the order has been processed and shipped. •We do not accept international PayPal. As an authorized dealer, every product sold by 17th Street Photo Supply is brand new and includes the full U.S.A. manufacturer's warranty. The warranty covers repair or replacement of defective parts, subject to the conditions set forth by the manufacturer. 17th Street Photo Supply, Inc. offers an exclusive money-back guarantee for its products. For Digital & Video Camera items, the return/exchange period is 14-days from receipt. No returns will be accepted on film, opened batteries, opened memory cards, computer software or opened memory card readers. All returns require a return authorization number from 17th Street Photo. Please call us for an authorization number. It is always the customer's responsibility to send any exchanges/returns back to us freight prepaid. Shipping and handling charges are not refundable. Shipping refunds for delayed carrier delivery are subject to the terms of the carrier.